“The Baby Quilt”, Oct. 2011, photographed Feb. 2014. The places in the center where the fabric is missing are where I used silk. Lesson learned there. 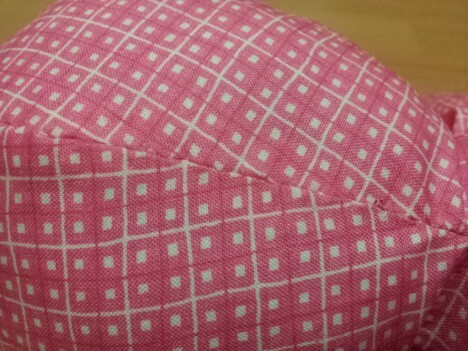 The rest of the center has a few split seams but is in decent shape otherwise. 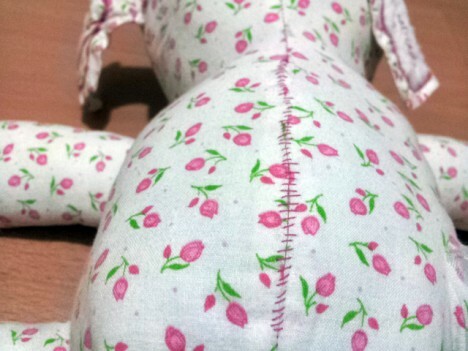 The inner border has issues on both seams. Thankfully, the back is in much better condition—a few of the rips from the front around the inner border are also present on the back, but they aren’t bad. 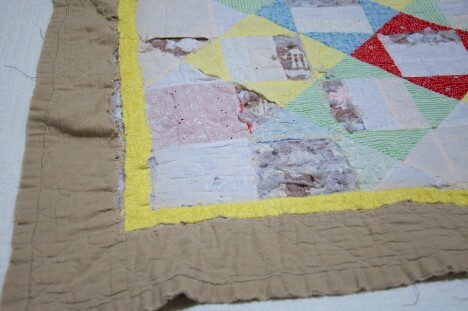 Mostly, the back just shows how badly the quilting itself held up. When I first looked at it, I didn’t think I could rehabilitate the front at all. But over the course of a few days of contemplation, I managed a plan. “The Baby Quilt”, Oct. 2011, photographed Feb. 2014 after restoration. First, I patched all of the missing silk pieces with an off-white cotton (stashed Moda Bella Etchings Stone if memory serves). I cut the patches slightly larger than needed, then used a three-step zig-zag to secure it, going over other loose seams while I was at it. It’s not the cleanest solution, but it is sturdy, quick (I was on a deadline), and gives it character. I added more colorful patch to the bottom corner where there was a small hole, and a couple to the back where holes had gone all of the way through the quilt. Because the borders were in such bad shape, I decided to completely cover them with new fabric by thinking of the quilt as a giant quilt-as-you-go block. 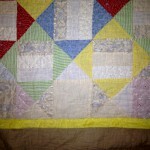 First, I replaced the inner border with a yellow flannel from my stash. Then, I made the outer borders with a brown flannel that is very similar to the one I used originally. I sewed the seams for both with the three-step zig-zag to better hold the holey fabric below, then topstitched over them with the same stitch for even better holding-power. I stitched a line of quilting through the outer border to secure it to the back, bound it with more of the brown flannel, and called it good. The binding isn’t the best job, but is secure. 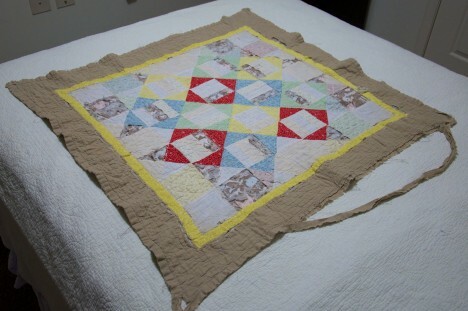 Hopefully its owner will let it get some rest in favor of his newer quilt, but at least it’s in stable condition again. A lot of threads need to be trimmed from the failing quilting, too, but I haven’t done that part yet. Coming soon: photos of the quilt for his sister that I should have finished this week, but alas, will have to wait another week or two. Sometime around now (give or take a month) is the nebulous second anniversary of when I started quilting and sewing again in earnest. I think I have a ton more to learn, although I know I’ve learned a great deal in the intervening months. 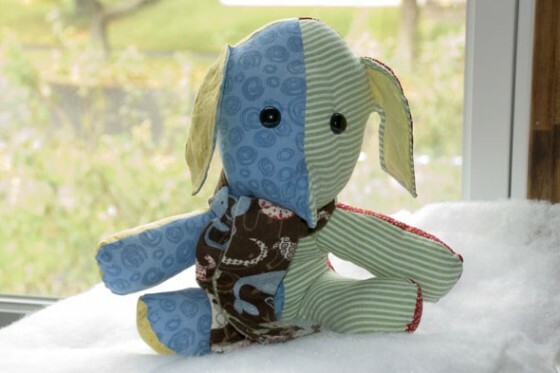 I think the stitch is called the ladder stitch, if you want to look it up. My actual stitch is some sort of hack I figured out when starting to bind quilts and not wanting the thread to show, so it’s probably not precisely the ladder stitch. But, sometimes the lessons are a little harder. When I set out to start quilting by making a baby quilt for my oldest friend’s son, I knew absolutely nothing about quilting. Sure, I’d been sewing on and off for about fifteen years, which is why some of my choices probably didn’t faze me at all, but it’s really not very smart quilt production. 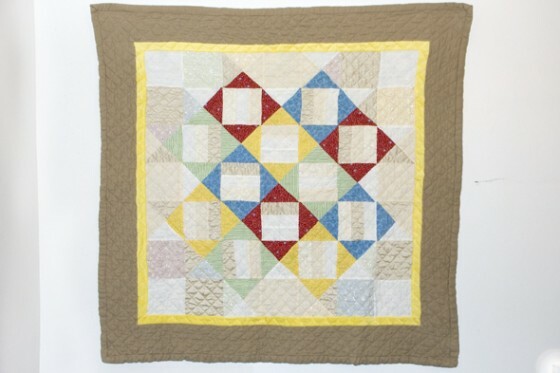 It has faux-Minky, flannel, silk, eyelet, linen-textured cotton and cheap quilter’s cotton all thrown together. 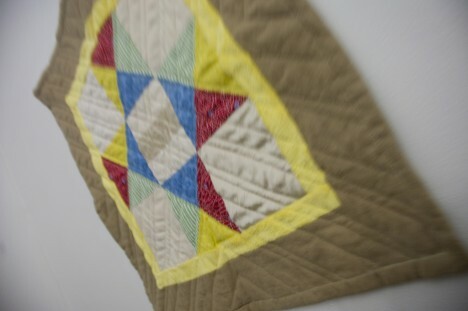 It’s also incredibly well loved—to an extent that I only hope the rest of my quilts can ever match, possibly all together. As a result, I got a message from my friend showing that the silk is starting to completely wear away. I think the only solution is to applique a better-lasting fabric over the top of those pieces, correct? 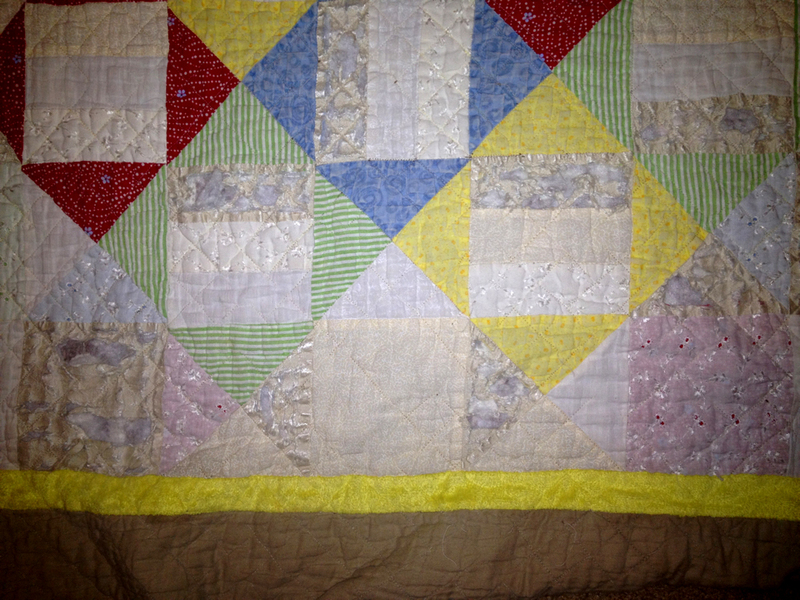 (Short of completely deconstructing the quilt and re-piecing, which is not an option.) I would love any advice you have about fixing damage like this. 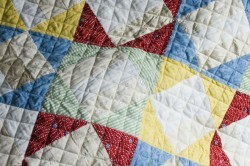 Two years into my journey, I still don’t think that you can’t use non-quilting cotton in quilts, but there are disadvantages, and I feel pretty safe in saying don’t use silk in a baby quilt. What have you learned over the years? Have you encountered bad choices that you’ve had to compensate for down the road? This past weekend was the one year anniversary of completing my first quilt. I’ve now completed a grand total of seven, and have five more in various states of progress (plus another one or two packed away for some rainy day). Life has been busy, and I haven’t sewn much lately—nor did I finish the Devil in a Blue Dress for Halloween for the third year running. 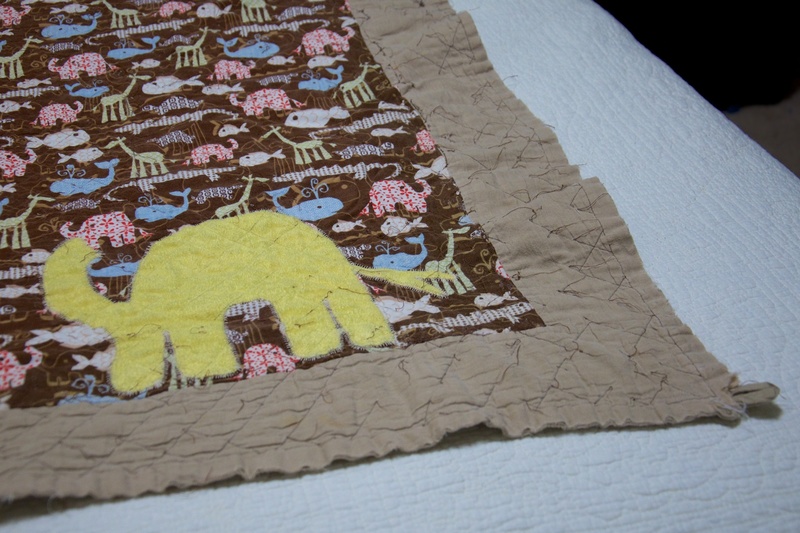 The project that started this new quilting hobby of mine was the idea to make a quilt for my oldest friend’s baby-on-the-way. 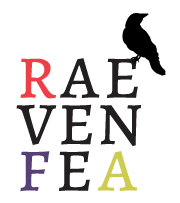 Because she reads this blog occasionally, I couldn’t talk much about it while I was working on it, but now that it’s done, I get to share! I started the fabric shopping plan with a certain quilt plan in mind—a simple sashed nine-patch layout—but then came across a bit of fabric that I fell in love with. The design didn’t suit the small squares of the nine-patch, though. 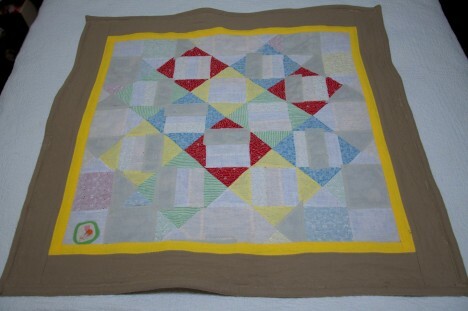 So, I decided to use the basic pattern of the 1930s–Inspired Wall Hanging featured on allpeoplequilt.com. 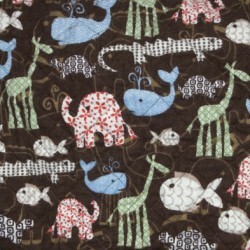 I went through a lot of their baby quilt designs and liked many, but when I saw this design, I not only liked it a lot, but realized it is about the same size as a crib quilt. I thought I could use my inspiration fabric as the outer border, and maybe as a square instead of the rail fence blocks. So, the choice was made. 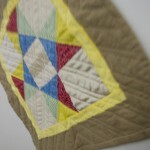 While I dig the ’30s reproduction fabrics, I wanted to go a little more modern with the quilt. The end result looks quite a bit different, don’t you think? The front and back of the quilt. The photos aren’t the greatest—daylight is slim these days, so I had to use flash. Although I can’t claim that my edges are totally square, they’re not nearly as off as they appear in the photos. The way I had to hang it to get photos ended up pulling it even more out of square temporarily. 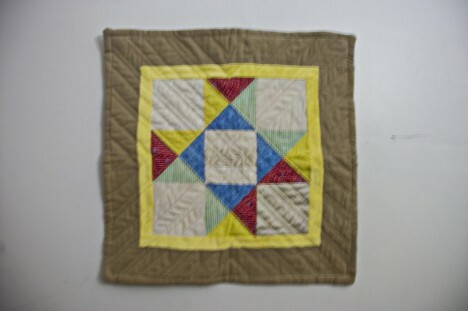 The entire quilt was based off the fabric that I used as a medallion on the back. (I intended to use it for the outer border, but couldn’t fussy cut it in a way that I liked without cutting off too many animal heads). I took my color cues from it, resulting in a palette of creams, red, blue, green and yellow. 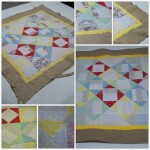 Ultimately, I decided to stick to four patterns for the offset square blocks mostly for simplicity’s sake. I picked up a fat quarter for each, which was more than sufficient. One part of the original design that I really liked is the way the center blocks are highlighted by the surrounding white prints and the center rail fence blocks. I wanted to keep that contrast. 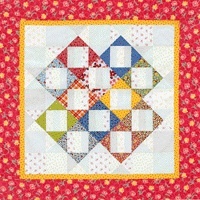 Then, I realized that the fat quarters that I chose are basic cotton prints, while the border fabric is a quilter’s flannel. That gave me the idea to play around with texture in the quilt, since babies and toddlers are very in to tactile sensation. These are the four colored fabrics for the front. I couldn’t get good photos of the whites. The result of that decision means that the white and off-white fabrics I chose were not just patterned, but different textures. Two are basic fat-quarter white-on-white/white-on-beige prints. Another is a 100% cotton linen-like weave. There are a few silk blocks. A cotton embroidered eyelet fabric was used as well, ultimately layered over the color fabrics so that there was something between the holes and the batting (which also gave a tint to those blocks, since the color bleeds through a bit). I grabbed each of these (except the fat quarters) from the remnant bin. To continue the texture bit, I also decided to use a different green fabric, swapping out the fat quarter I bought for a green/white stripped cotton seersucker. The inner border is a very fuzzy yellow furry-type fabric that seemed fun. 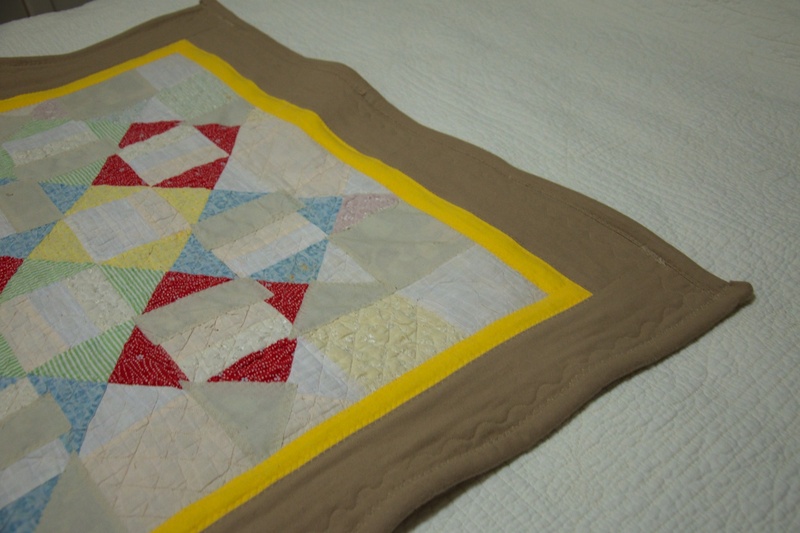 The outer border is a plain brown quilter’s flannel. 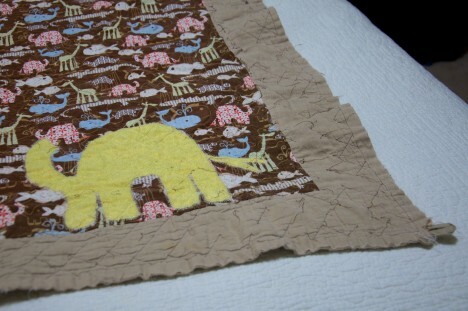 The back has a medallion of the inspiration fabric, with the same outer border as the front of the quilt, and an applique of the elephant shape from the inspiration fabric cut out of the yellow furry fabric. I hope the baby has fun exploring all the different textures. 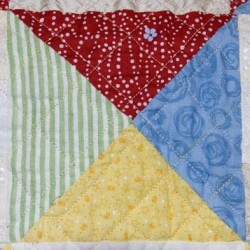 The project construction details that are provided by allpeoplequilt.com made cutting and piecing pretty simple. For the rail fence blocks, I tried to make sure the blocks were never made using the same sequence of the white fabrics. I then laid out all the pieces and did a lot of moving around of the pieces for the hourglass blocks and solid white squares so that the textures and patterns were distributed in a way that I liked. The instructions gave a very clear description of the steps needed to construct the four different hourglass blocks needed in the quilt. I sewed the pieced part one row at a time, then put the rows together. Adding the borders as described in the instructions was simple as well. I did modify the outer border plans so that it has a log cabin motif instead of two longer pieces and two shorter, because my fabric wasn’t wide enough for the two long pieces. I did a bit of piecing for the back, rather than making it plain. I had a yard of the inspiration fabric, which worked out perfectly for a square to mirror the 34″×34″ pieced square/inner border of the front. I added an outer border of the brown quilter’s flannel, again with a log cabin motif. 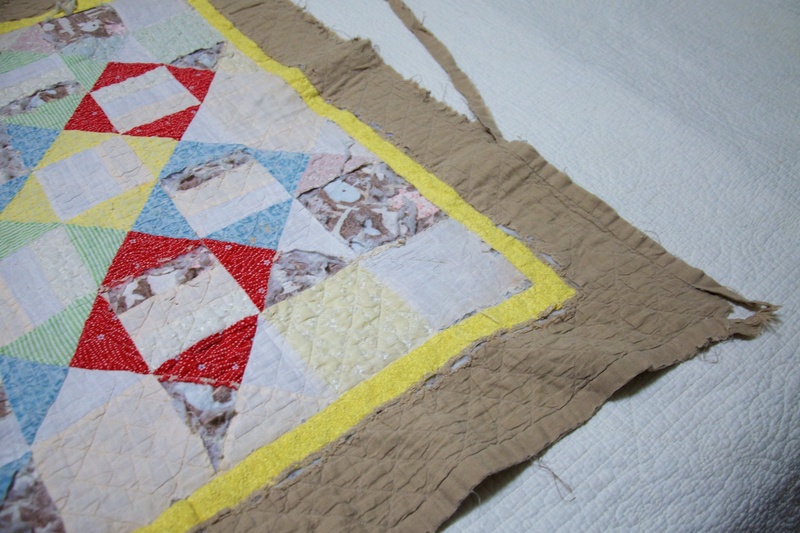 This border is a couple inches wider than the front’s—to be trimmed after quilting. I machine appliqued an elephant to the bottom right corner of the medallion for a little more interest. In hindsight, adding a little batting so that the applique was raised a bit would have been good, but didn’t think of that until after the fact. Well, I managed to quilt it. I used a ~1″ diamond pattern all over. I’m somewhat unhappy with how it came out, and yet happy at the same time. From a distance, it looks fine. Up close, you can see how uneven the grid is. I tried marking with chalk, but ultimately I need some sort of guide that attaches to my machine, because the chalk plan didn’t work. Also, about half the quilt shows the darker bobbin thread (I used dark brown on the back, ivory on the front), because my machine decided it wanted to mess with the tension and nothing I did changed it. Then, at the end, it decided to work correctly again. What can I say, it was a labor of love, and its imperfections show that? I had about 3″ of extra fabric on all sides of the backing, so I just folded it over and hand stitched it down, rather than cutting it off and using a separate binding. I think bias-tape bound quilts are more common, but I like the look of self-bound quilts, especially since my binding was going to be the same material as the edging on both sides anyhow. So that’s that. My first finished quilt. I learned a lot. I have a lot of improvements to make, mostly dealing with impatience making seams not line up properly. Now it’s time to go back to the wedding quilt and hope I can finish it before my cousin and his wife’s fifth anniversary. 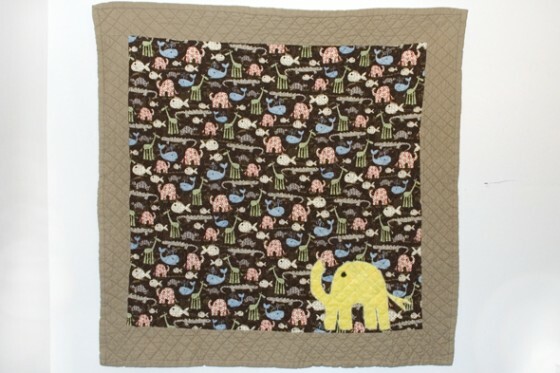 Judging by the time it took me to quilt this small crib quilt, their queen one seems very daunting. They’ve been married for two months so far… my goal is actually Christmas, but I’m already doubting myself there. 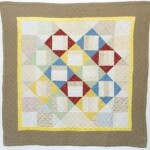 I’m visiting my friend Sammi and delivering the baby quilt this coming weekend. 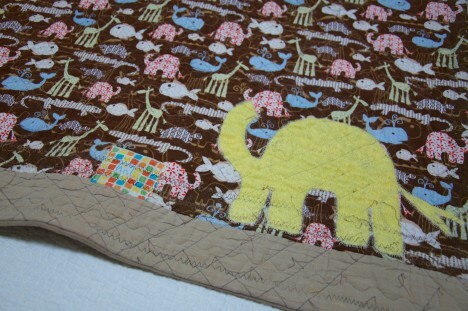 Here’s a sneak peak of the quilt, and a shot of the elephant I made out of the leftover material. It’s Simplicity 2613 again. 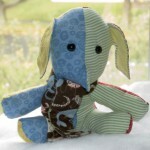 I used each of the four colors for each piece, and the border fuzzy yellow fabric for the ear inserts. The scarf is made from the backing fabric with little pieces of selvage on the end—they made perfect fringe. 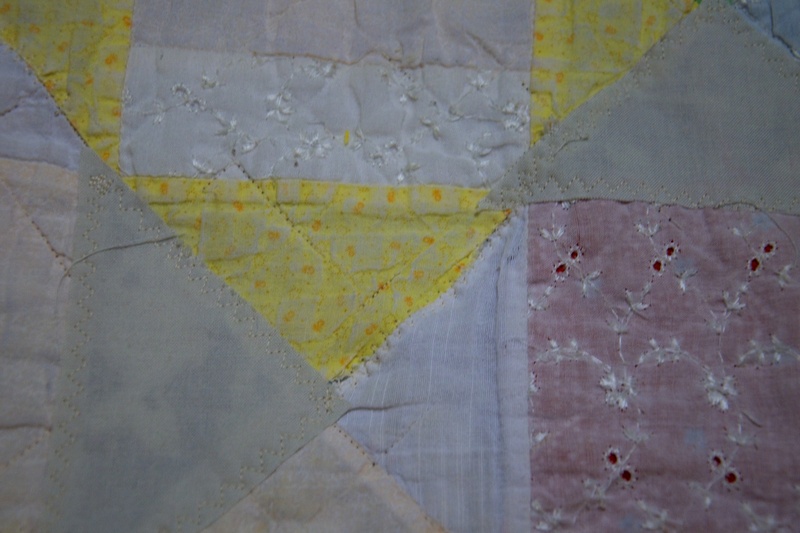 The quilt is in the wash right now; I’m having a bit of an issue getting the yellow chalk lines out that I used as a grid for quilting. One wash didn’t work, so if they’re still there, I guess I’ll just have to claim they were a design decision or something. At least they match the color scheme. I learned my lesson about using chalk in the future though, that’s for sure.